This website is designed to bring our citizens closer to county government and to keep you informed on what is going on. To receive the latest new sign up for our email alerts. Cook County was the 153rd county formed in Georgia. It was created from Berrien County and named for General Philip Cook, who fought in both the Seminole War and the Civil War and was Georgia's Secretary of State for over 20 years. The county courthouse was constructed in 1939, one of many depression era public works projects in the state. This courthouse is also listed on the National Register of Historic Buildings. Points of Interest: Another historic building, located in Adel, is the Jim Paulk-SOWEGA Building, owned by the Adel-Cook County Chamber of Commerce. 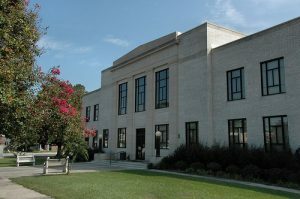 The building was constructed in 1930 and originally the home office of Southwest Georgia Melon Growers Association (SOWEGA), which started in 1920 as the only cooperative association for marketing watermelons in the world. One of the first roads cut through the Wiregrass Territory ran through Cook County at Cecil. This road, known as the Coffee Road, was called for by an act of the state legislature in 1823 and was built by General John Coffee. The Coffee Road became a main thoroughfare for early settlers, who traveled to Tallahassee and the Gulf Coast for salt and other staples. Reed Bingham State Park is located in the county. The park has a variety of recreational facilities centering around a 400-acre lake, where swimming, skiing, boating, and fishing are excellent. Other facilities include campsites, nature trails, miniature golf, and picnic shelters. Some of Cook County's festivals include the Brushy Creek Muzzleloaders Spring Shoot and Rendezvous in March, the Annual Turnip Trot in November, and the Lean-Ox Festival, also in November.